Marketers and customers don’t see eye to eye. Marketers build web sites, send direct mail, manage social media and execute search engine marketing campaigns — often with different groups managing each task. Customers don’t care about your silos. 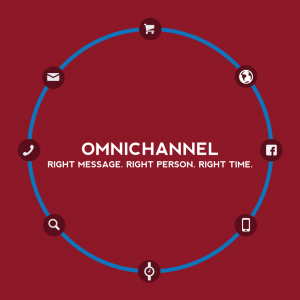 They are fervent believers in omnichannel engagement and they expect you to keep up. They flow from offline to online much more fluidly than your campaign silos allow. For customers, each interaction with your brand is part of a continuum of experiences. Analegy helps marketers tie those experiences together so that you’re better able to deliver the right message to the right customers at the right time. Your customers buy the way you do. They research on their phones, check prices in stores, research reviews from their phones, and talk about their purchases on social. The key to getting them to choose your products is to provide a seamless experience across all of the channels. There is an expectation from customers today that you’ll do more than just sell products. They want you to acknowledge them and their needs. They expect you to know who they are, to deliver personalized offers, to make it easy for them to engage with your brand and, essentially, show that you value them as an individual. They want to know the person behind the credit card is important to you. Enabling omnichannel experiences means understanding your customers, their cross-channel behaviors and ensuring they’re getting consistent, outstanding service regardless of where they interact with your brand.